"This recipe is tasty and very easy to make. Great to slice up for a party or for Sunday football. Serve with blue cheese dressing for dipping sauce." Preheat oven to 410 degrees F (210 degrees C). Grease a pizza pan. Place chicken into a large pot and cover with salted water; bring to a boil. Cook the chicken breasts until no longer pink in the center and the juices run clear, about 15 minutes. An instant-read thermometer inserted into the center should read at least 165 degrees F (74 degrees C). Transfer chicken to a bowl and shred with two forks. Melt butter in a skillet over medium-high heat. Cook and stir chicken and Buffalo wing sauce in the hot butter until chicken is coated and heated through, 2 to 4 minutes. Turn pizza dough out onto a generously floured surface. Roll dough into a 12-inch round. Brush dough with 1 tablespoon vegetable oil and spread 1 cup mozzarella cheese in the center of the dough, leaving a 1-inch border. Spread chicken mixture over cheese; top chicken mixture with remaining 1 cup cheese. Fold pizza dough in half and pinch edges together to seal. Transfer calzone to prepared pizza pan and brush top with remaining 1 tablespoon oil. Bake in the preheated oven until crust is golden brown, 17 to 20 minutes. 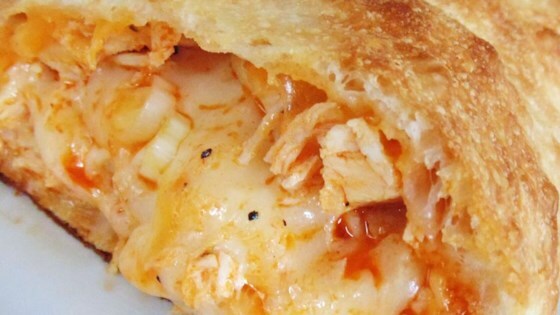 Your favorite wing flavor goes full throttle in this crowd-pleasing calzone.